A computer station is located on site and wireless Internet access is complimentary. This hotel offers access to a 24-hour business center and a meeting room. Guests can enjoy a complimentary breakfast each morning as well as a complimentary manager's reception on select days. Event facilities measure 630 square feet (59 square meters). 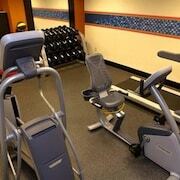 This business-friendly hotel also offers a fitness center, multilingual staff, and a picnic area. Complimentary self parking is available on site. Hampton Inn & Suites Greenfield is a smoke-free property. 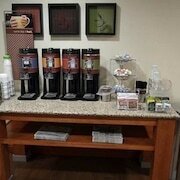 A fitness center, a 24-hour business center, and coffee/tea in a common area are available at this smoke-free hotel. Free buffet breakfast is provided, as well as free WiFi in public areas, free self parking, and a free manager's reception. Other amenities include a meeting room, laundry facilities, and a 24-hour front desk. All 68 rooms provide free WiFi and free wired Internet, flat-screen TVs with cable channels, and conveniences like sofa beds and refrigerators. Guests will also find microwaves, coffee makers, and down comforters. 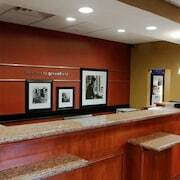 Hampton Inn & Suites Greenfield offers 68 air-conditioned accommodations with coffee/tea makers and hair dryers. Beds feature down comforters. 43-inch flat-screen televisions come with premium cable channels. Refrigerators and microwaves are provided. This Greenfield hotel provides complimentary wired and wireless Internet access. Business-friendly amenities include desks and phones; free local calls are provided (restrictions may apply). Additionally, rooms include irons/ironing boards and blackout drapes/curtains. Housekeeping is provided daily. A complimentary buffet breakfast is served each morning between 6 AM and 10 AM. The hotel offers a complimentary manager's reception on select days.